It wasn’t too long ago when we mere consumers and business pundits suggested the end of RIM’s BlackBerry lineup of devices, following the insurgency of Android and iPhone in a market that was BlackBerry’s niche. However today, the company is very proudly offering up to $550 to iPhone users to dump their smartphone for its latest; the BlackBerry Passport. The BlackBerry Passport is truly one unique device that offers a very productive large screen which does not care much for the typical 16:9 ratio that most smartphones out there are focusing on, and goes on to offer a 4.5-inch display which may seem smaller than that on that iPhone 6, but at 1440 x 1440 pixels and 1:1 aspect ratio, you will find yourself with enough room without needing to rotate the phone. Oh and it sports a QWERTY keypad with some serious tech inside of it. I’ll leave the specs for you to dig up; for now the promotion is offering trade-ins for users with at least an iPhone 4s looking to move to the new Passport. BlackBerry is further offering a top-up of $150 as well for users trading in their iPhones for the Passport in addition to the trade-in value. So for example, if you have an iPhone 5 with a trade-in value of $150, you will be getting back $300 in your pursuit to buy the Passport. Just to be clear, you’re not exactly being paid $300 and getting the Passport, and granted BlackBerry needs to make some serious inroads, it is still not that desperate. Of course the trade-in value will further vary with your iPhone’s storage size, carrier and much importantly, its physical condition as well. 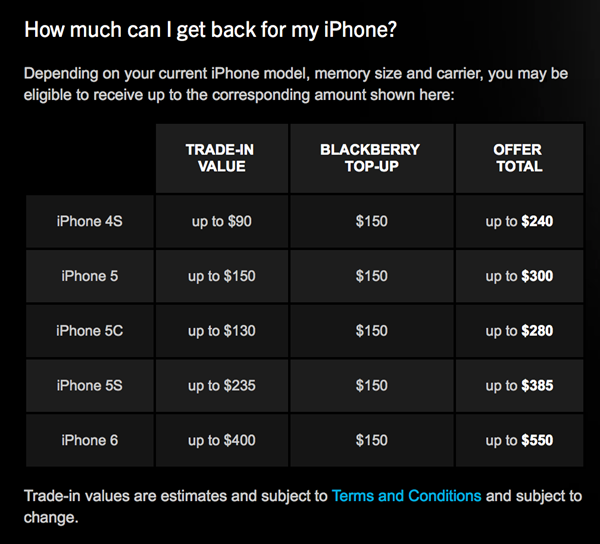 The iPhone 6 – as per the chart from BlackBerry – actually has a maximum trade in value of $400 and if it wasn’t for the $150 top-up, users would be staring at BlackBerry with one eyebrow raised. For those more concerned with office work and large screens to work with, the Passport running the new BlackBerry OS 10 is a potent smartphone in its own right where the company is working hard and fast at bringing in some truly unique features to the OS, and while it does manage to run Android apps, it still does not have the prowess of Apple’s App Store, or Google’s Play Store. From the hardware’s point of view, I think even the most die-hard iPhone fans will acknowledge the amazing build quality of premium BlackBerry devices. 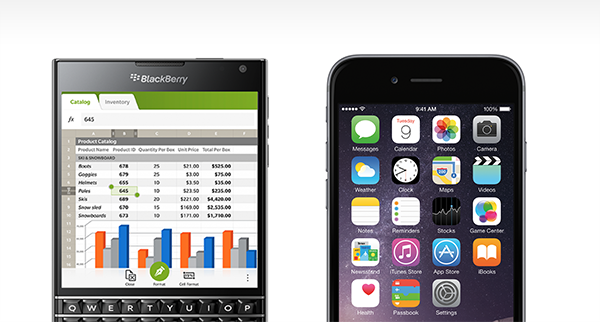 Would you want to trade in your newly bought iPhone 6 for the BlackBerry Passport? Then you go put cement in your boots and jump off a bridge. LOL! Heck no! Thank you, BlackBerry but no thanks.. Never! Oh man, this is going to display QR codes like a champ.